Economies of post-Soviet Central Asian countries and their development directly depend on China with its economic clout. Aware of the need of stable markets to dump goods and commodities into, the government of China actually encourages its businessmen to establish joint ventures in nearby countries. It enables the Chinese to exert influence with these economies from within. This influence is then used to establish these economies' dependence on Chinese manpower. Mass torrents of low-paid manpower originating in China meanwhile foment fears in citizens of Central Asian countries that they may find themselves driven from their native territories one fine day. 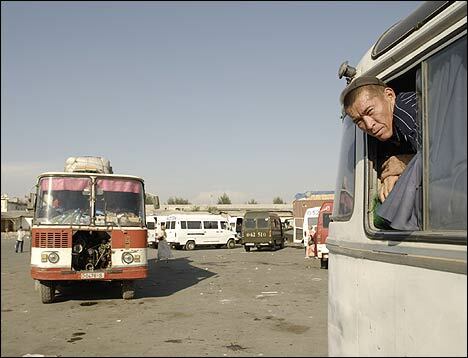 Kyrgyz businessmen and manual workers fall back before the Chinese expansion and seek employment abroad. Osh is the southern capital of Kyrgyzstan. A major Chinese company invited Osh city fathers to visit Kashgar last year and arranged their meeting with local business circles. When the visit was over, a Kyrgyz-Chinese joint venture was established in Osh. Chinese businesses built four brick works near the city, each producing 70,000 bricks every twenty-four hours. Mayor of Osh Jumadyl Isakov claims that several Kyrgyz-Chinese joint ventures were established in the city last year. "Along with everything else, we have plans to organize production of spare parts here for the future industrial park where Chinese furniture, refrigerators, and other home appliances will be made," Isakov said. "As for Kyrgyz-Chinese joint ventures, we need more of them. For example, we need brick works, a leg wear garment factory, factories pouring out articles of plastic, cotton, and so on. All of that means jobs for our people." This correspondent asked Isakov about markets for the future industrial boom. The major said that it was being taken care of right now. "Provided the quality is adequate, we will export the goods to Russia, Turkey, and other countries," he said. Isakov in the meantime went on giving this correspondent chapter and verse on what he clearly regarded as accomplishments in the sphere of cooperation with the Chinese. "We have another joint venture here that makes metal ware - fittings, pipes, and so on," he continued. "The Chinese will build a cement mill here as well. Other plans stand for development of a coal pit in a settlement not far from here and development of its infrastructure depends on the Chinese too..."
Isakov admitted in the meantime that the Chinese usually became foremen and engineers (not to mention executives at all levels) and employ Kyrgyzes only as manual workers. It seems that Chinese engineers are not precisely in a hurry to help their Kyrgyz colleagues master Chinese equipment. "The brick works has been working for over a year already but they [Chinese specialists] are secretive and tight-lipped on how their equipment works," Isakov said. "They do everything without telling our men anything. I regularly ask the Kyrgyzes working there whether they think they could operate the equipment and they always reply that the Chinese never teach them anything." All these problems notwithstanding, the mayor looks at cooperation with the Chinese with favor. He clearly assumes that development of the southern capital of Kyrgyzstan depends on the extent and degree of involvement of the Chinese in the process. "We've planned construction of several multistory buildings in Osh," Isakov said. "That the Chinese will be building them goes without saying because Kyrgyz construction workers cannot match the pace the Chinese set. Moreover, we are somewhat short of finishers, bricklayers, and so on because so many of them are away in Russia or Kazakhstan. In fact, offering our people jobs is in our own interests. Just pay a fair salary, and people will certainly become interested." As far as the official is concerned, Chinese companies offer reasonable terms. They offer to build tenements at two to four times below the cost construction companies from other foreign countries suggest. What local workers this correspondent met with, however, claim that the pay the Chinese offer is anything but fair and labor conditions are anything but normal. One Abakir Zairov, a finisher, has just returned from Yekaterinburg in Russia. Six months of labor there and he went home almost $3,00 richer. "It's not that I'm lazy or afraid of work," he said. "On the other hand, I do see how Chinese manual workers in Osh work 12 hours a day with a single day off a month. All of that for literally a pittance. The people live in appalling conditions, 10 men to a cramped room. They are paid about $100 a month and they do not even grumble. I reckon that it's fine by them - but not by me. I do not think I can keep up with them, and for this sort of money at that." Zairov is convinced that other Gastarbeiters are of the same opinion. In the meantime, it remains to be seen yet if Chinese construction companies will want to pay Kyrgyzes more substantial salaries when they have virtually unlimited manpower in China itself. According to the data compiled by the Kyrgyz State Committee for Immigration and Employment, the number of Chinese businessmen in Kyrgyzstan increased enormously in the last two years. Increasingly more Chinese vendors are seen in the largest Kyrgyz marketplaces these days - another indication of their growing presence in this country. It was only recently (a couple of years ago, no more) that the Uigurs from the Xinjang-Uigur Autonomous District constituted a majority of the Chinese in Kyrgyzstan, but even that is changing. More and more Hans, representatives of the largest ethnic group in China, come to Kyrgyzstan to stay, these days. Coming to Kyrgyzstan as tourists, the Chinese usually disappear into the Osh region or Chui Valley and immediately start looking for ways and means of remaining there forever. 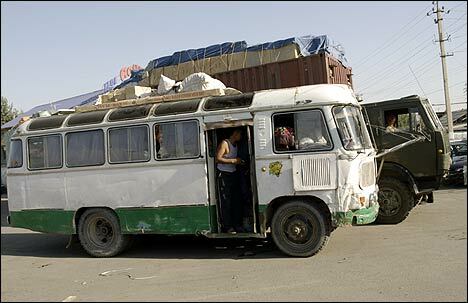 They mostly settle in Qorasuv and Bishkek where they rent apartments to live in. Five to six Chinese to an apartment constitute small communities. One Emil, a police officer on the beat in the vicinity of the Qorasuv market place, told this correspondent that the number of Han vendors there showed an almost 20% rise over the last twelve months or so. "Nearly 5,000 Chinese work here at the marketplace, these days. Many Chinese try to marry here to legalize their stay and obtain Kyrgyz citizenship," Emil explained. Kyrgyzes, particularly elderly Kyrgyzes, frown at these mixed marriages viewing the Chinese as "infidels" or "atheists", but girls are convinced that their marriage to the wealthy Chinese was not a bad idea at all. 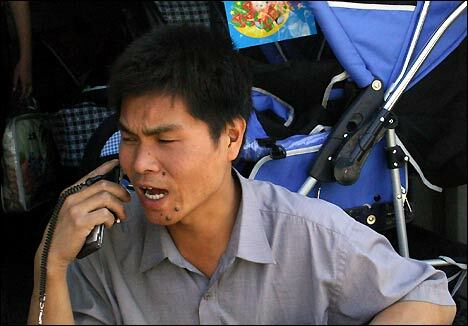 As for the Chinese themselves, they never advertise their marriages to locals. Kamchybek Tashiyev, ex-deputy of the Jogorku Kenesh [national parliament] says that the Chinese involved in all kinds of business activities in Kyrgyzstan number over 20,000. "Very many of them have children who are registered as citizens of China too. Not long now, and we will see their grandchildren who won't even speak the Kyrgyz language," Tashiyev said. Zulfia has been a vendor for over four years now. "There are over 5,000 Chinese here now," she complained. "Their numbers swell by the year. A Chinese comes over here all alone today and brings over his three relatives - at least three - a year later." The Osh Regional Directorate of Internal Affairs maintains in the meantime that it has issued only 1,500 or so licenses (work permits) to the Chinese. It makes the rest of the Chinese in this Qorasuv marketplace alone illegal. According to the government of Kyrgyzstan, 8,000 foreign workers enter the country every year to disappear in it shortly afterwards. The Chinese who hired the locals to sell their goods and commodities in Qorasuv only half a year ago do so themselves nowadays. Actually, some of them do hire students studying the Chinese language. The girls themselves (they are girls, of course) say that it is a perfect opportunity to practice their language skills and a chance perhaps to "hook" a wealthy Chinese. Vendor Leili Japarova brings goods and commodities to Qorasuv from Urumchi. Talking to this correspondent, she said Kyrgyz businessmen were becoming somewhat of a rarity now. "That's because the Chinese bring their own goods here and sell them too," Leili explained. "It does not take a genius to guess that they sell them cheaper because they acquire them cheaper and without trouble in the first place. Kyrgyz businessmen were forced out of here. They packed up and left for Russia, leaving the market to the Chinese." Leili herself was not leaving because of her children, twin daughters nursed by the elder children. She said she would leave the moment the toddlers grew up some. The government of Kyrgyzstan tried to oust foreigners from trade on the territory of the country and issued a ban earlier this year. It was allegedly done so as to bring Kyrgyz immigrants back from Russia. 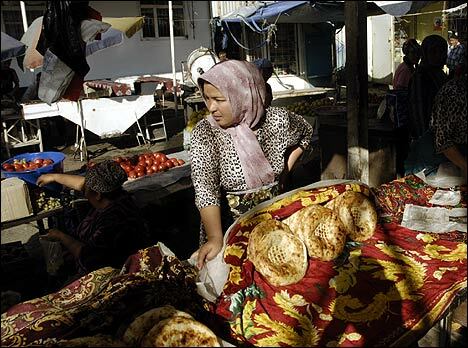 According to various estimates, between 600,000 and 1,000,000 Kyrgyzes work in Russia and Kazakhstan these days. About 15-20% of them are believed to be working precisely in the sphere of commerce. It was these Kyrgyzes, more or less successful and prosperous, that the government was after. As it turned out soon enough, the Kyrgyzes who left the country once do not mean to return to it again. Most of them apply for Russian citizenship or, at the very least, long-term residence permit. Ernis and Gulmira Jainakovs, a married couple from Bishkek, already obtained Russian citizenship. Every now and then they visit the capital of Kyrgyzstan where their children are about to finish school, buy Chinese goods in the Dordoi marketplace, and sell them in Novosibirsk. 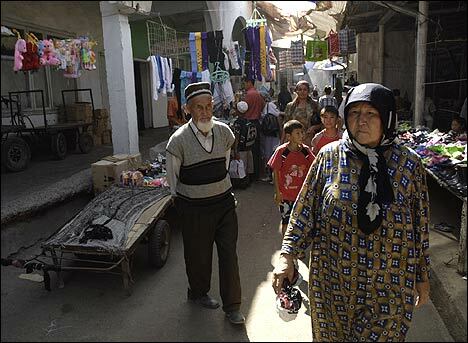 The Jainakovs were not impressed at all upon hearing of the ban to foreigners to buy and sell goods in Kyrgyzstan. 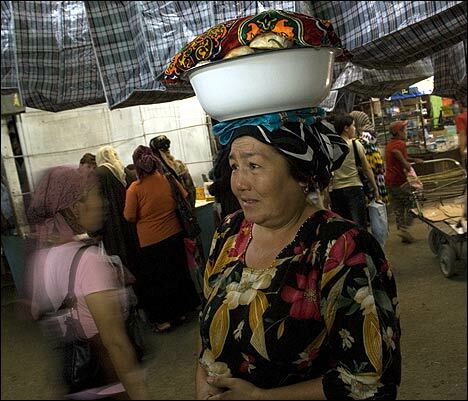 "First, odds are Kyrgyz vendors and businessmen are not going back. Second, the Chinese are already here. Third, the Kyrgyz authorities know better than deprive themselves of the chance to milk foreign vendors," Ernis sneered. "Besides, we are quite well off in Russia top even think of coming back here to stay." The attempt to dam the influx of the Chinese failed. The government announced at the last possible moment that the resolution would come into force on January 1, 2008. No need to say that it was scared by the possible wrath of the Chinese. 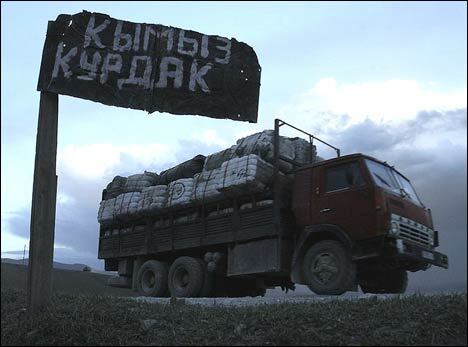 Surveying border districts of China, this correspondent met a local businessman in the process of organizing a shipment to Kyrgyzstan. The man spoke quite passable Russian he had learned when working in Qorasuv. (He also spoke Uigur, a language sufficiently close to the Uzbek language to permit mutual understanding.) He said the government of China was encouraging businesses and helping them. "Being wealthy is nice," he explained. 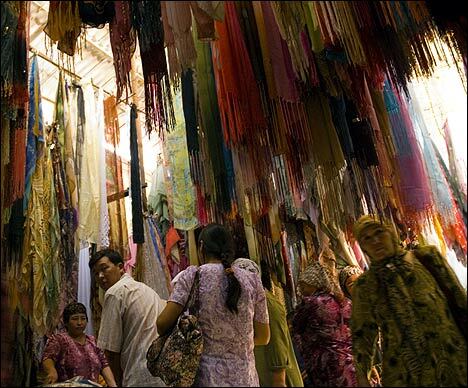 "Actually, the poor are disliked in China even though the government helps them too..."
Indeed, Chinese vendors that are seen in Kyrgyz marketplaces are better off than their local rivals. Back in China, people carry plastic IDs. Whoever wants to travel abroad has apply for the passport that costs (officially) over $5,000. Those who can afford a sum like that usually end up as vendors abroad to make up for the cost of the passport and official Beijing offers Chinese vendors abroad loans on very comfortable terms. 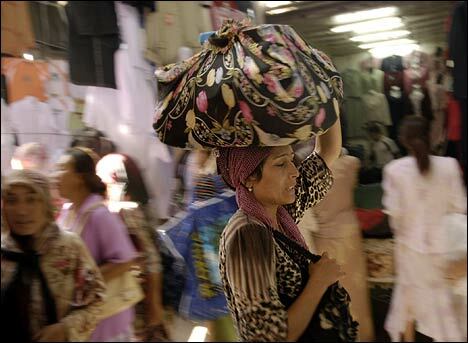 Unable to compete with the Chinese in their own country, Kyrgyz vendors move to Russia. Walking the Dordoi marketplace, this correspondent talked to some Chinese working there and passed on the Kyrgyzes' complaints. "Come on, we do not drive anyone from anywhere," a vendor said. "We are making it easier for the Kyrgyzes. They buy goods from us cheaper than they will from intermediaries. Also conveniently, they do not even have to travel to China because we bring everything right here. They buy the goods from us and take them to sell in Russia..."